Sit sideways on a stable chair with your right side next to the back of the chair. Keep your feet and thighs slightly apart and parallel. Sit erect, looking straight ahead. As you inhale, lift your trunk and turn your chest to the left. Hold the backrest of the chair. Lift your torso, keeping your shoulders level and opening the chest. Breathe evenly as you continue to lift and twist the spine, without letting your buttock bones move from their original position. 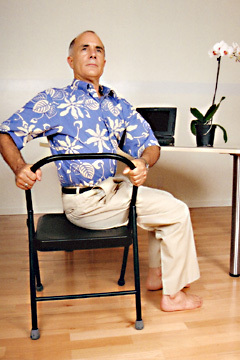 Robert Kay performs the sitting chair twist.